One of the most frequent questions we get asked about Chiang Mai by gay visitors, is where to stay. Whilst the simplest answer is check out the accommodation section in our gay guide to Chiang Mai, the question deserves a more in depth response as there are different options depending on what one wants to do and accomplish in Chiang Mai. As we enter Chiang Mai’s high season we hope this article will be both timely and useful. As always with accommodation, location is key so where you want to go, and what you want to do in Chiang Mai are crucial factors. Chiang Mai has a number of specifically gay hotels and guesthouses. Most of these are located around the Santitham area in Chang Puek district. Perhaps unsurprisingly, this area is also home to most of Chiang Mai’s gay nightlife, as well as several gay owned restaurant’s and cafés, making it the obvious choice of where to stay if you want to enjoy that scene. Chang Puek is adjacent to the trendy Nimmanahaeminda, district which is packed with trendy bars, restaurants and coffee shops as well as several of the big clubs which are quite gay friendly. It’s also nearby the Kad Suan Kaew shopping centre and Chiang Mai’s oldest gay sauna, the House of Male sauna. Chang Puek and Nimmanhaeminda are where Chiang Mai’s two big gay dance clubs G-Star Vintage and See Man Pub are located. 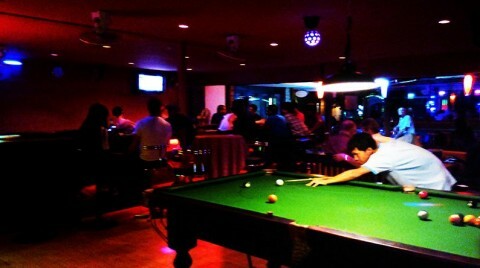 These are the places gay Thais go to enjoy themselves and are the must see places for visitors who like the club scene. They are especially popular at weekends so plan your dates accordingly. Since opening in January, the jewel of the Chang Puek district has become: The Maya lifestyle mall. 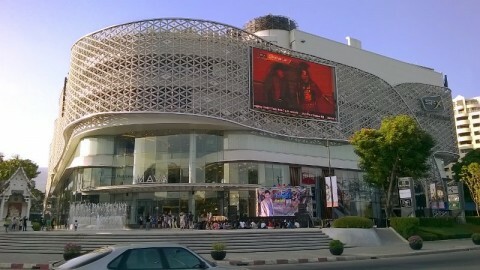 This ultra-modern structure is located right at the junction of Nimmanahaeminda Road, Huay Kaew Road and the superhighway. Maya has brought an abundance of new dining, shopping and entertainment options to the area and has a rooftop bar area with superb views over the city and mountains. 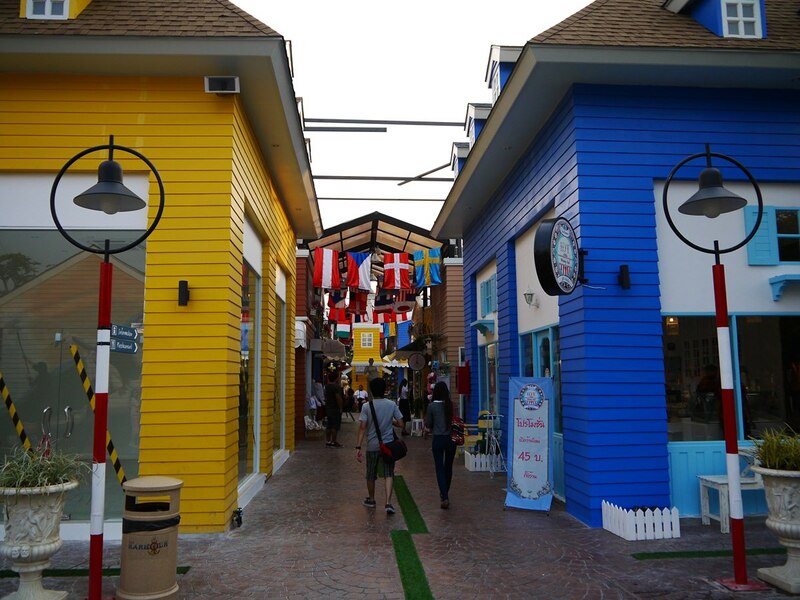 There is also the Harbour Mall, a totally different concept, located a few hundred meters further along Huay Kaew Rd towards Doi Suteph mountain. Not far from the Maya Mall, on Huay Kaew Rd Soho Bar and Guesthouse provides some nice rooms close to Kad Suan Kaew and has the advantage of a lively bar downstairs; a popular socialising place for Chiang Mai’s gay ex-pat community. Soho is run the very sociable Shauna, you can read more in this article: “The Shauna Pugh Story”. Also, on Huay Kaew Rd is the highly recommended PJs Place, a small yet high quality guesthouse whose’ friendly owners have built up a solid reputation. Book early as PJs is often full. Or for another accommodation possibility on Huay Kaew, check out our hot tips below. If Go-Go bars are what you want, the old gay favourite, Lotus Hotel, is right across the road from the legendary Adam’s Apple Club, Chiang Mai’s best known gay bar. Lotus Hotel’s Garden Bar remains a great place to relax with a drink before visiting the club or enjoy a chat with new friends. Downstairs from Adam’s Apple is Metro Bar with some very cute and friendly staff, open all day, Metro offers both food and drink. Or, a short walk away is Sabbai Dee Santitham, a great gay owned Thai food restaurant, and they have the adjoining Santitham Guest House too. Many visitors like to spend the winter in Chiang Mai and are looking for accommodation for several months. Whilst most gay hotels and guesthouse will quote long term rates, there are many other non-gay options for serviced apartments in the Chang Puek and Santitham areas. This recent article Places to stay in Chang Puek and Santitham gives the full low down on other non-gay accommodation options, both condos and hotels. For the gay visitor looking for something different try Club One Seven. Located in an antique teakwood northern Thai style mansion on the river to the south of the city, Club One Seven is both a gay guesthouse and a gay sauna and gym. A great place to enjoy a relaxing stay and meet plenty of new friends. The main tourist zone in Chiang Mai is around Thapae gate spreading east to the river. 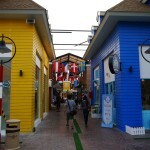 This area is packed with hotels, bars, restaurants, tour agencies, souvenir shops and tourist markets. Chiang Mai’s Night Bazaar was once the cities most popular night time location and a bastion of the gay scene too. However, the Saturday and Sunday walking streets have taken over as the place to go and buy handicrafts and trinkets, whilst there are now only a couple of gay orientated beer bars left after the closure of both “The Peak” and “Sleaze Alley” in recent years. There are a few gay massage shops at various locations within the tourist area. The popular Secrets Bar moved to a bigger and better new location on the moat whilst the friendly Ram bar is located a little bit out of the tourist district on the river meaning the tourist bar scene is now rather spread out. 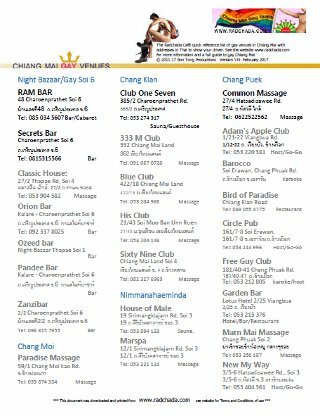 If visiting the commercial gay bars is your main interest you would be better off staying in Chang Puek and getting a tuk-tuk to take you to the different tourist area bars. But, if you are interested primarily in doing the tourist thing and aren’t looking for gay accommodation, the downtown area is still a good choice of where to stay. There are numerous non-gay accommodation options in this part of town. Check out the regular hotel websites such as tripadvisor for some ideas. The downtown tourist area is blessed with some wonderful four and five star hotels which are always worth enquiring about even if you think luxury hotels are beyond your budget. Outside the peak holiday periods, these places run at quite low occupancy rates and there are some great deals to be had if you shop around. You may be pleasantly surprised at just how cheap! Places to try include the Dusit Group’s D2 and the le meriden at the Night Bazaar (situated close to the two gay bars there), the Anantara Resort & Spa is a splendid option down on the river, as is the Shangri-La. Other luxury options downtown include Rachamankha, Sirilanna and Manathai Village inside the old city. Across the river there is the 137 Pillars House or, if you want the peak of luxury about the best in Chiang Mai is the Dhara Devi, a few km east of the city. There are plenty more and too many to list here. If you have a restricted budget, the downtown area still has plenty more budget guesthouse and mid-priced hotels. Prices can be as low as $15 USD per night, but remember, you get what you pay for. Outside of Chiang Mai there are number of luxury and budget resorts which are ideal places to stay if you are looking to get away from it all and enjoy the peaceful Thai countryside. 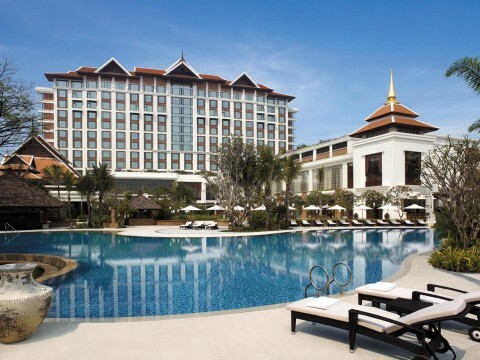 Best known is the Four Seasons resort Chiang Mai, one of the world’s top resorts. Located near Mae rim, 20 Km North of the city this is the standard setter that others have to follow. For gay customers, a small gay alternative is Soulmates Retreat in countryside near Doi Saket, around 15 Km east of the city. This article gives many suggestions for where to stay in Chiang Mai, but we can only provide details of a few places given that the choice of hotels in Chiang Mai is several hundred. However, we couldn’t resist finishing with a few gay friendly tips of our own. These are places that depending on your requirements we are sure you will be satisfied with, and you won’t find these gems in any other gay listings. The Nimmanheminda area is now one of the most popular parts of the city and the “in place” for Chiang Mai’s wining and dining scene. However, the area does not have so many accommodation options and gets packed with traffic at night. Our recommendation for staying here is the luxury, yet not unreasonably priced Kantary Hills Hotel. Located in a quite soi off the main road it is free from traffic noise and congestion, whilst many, many places to eat and drink can be found within easy walking distance. The Nimman Bar and Grill at Kantary Hills is a popular dining venue for ex-pats. Now in it’s forty sixth year “The Pub” is a Chiang Mai institution, the imaginative name derives from a time when there were no foreign tourist bars in Chiang Mai, and “The Pub” was the main meeting place for Chiang Mai’s small ex-pat community. 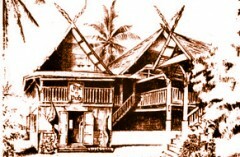 This antique Thai style wooden structure has been transformed into a Chiang Mai interpretation of an olde English Pub and is still a favoured ex-pat haunt. 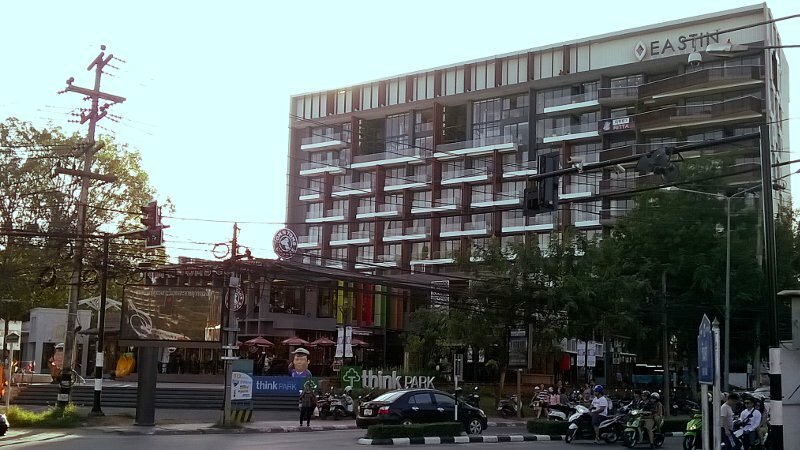 It is set back from the main road on a large piece of land on Huay Kaew Road, close to both the Nimmanheminda area and Chang Puek, it is directly opposite the new Maya Shopping Mall and adjacent to Think Park, giving “The Pub” a fantastic location. Being on the main road makes it easy to get public transportation to other parts of town. As well as being a great place to get both English and Thai food, and a range of decent beers, “The Pub” has several studio bungalows in the grounds. Although not a gay bar as such, the management are very gay friendly and “The Pub” is popular with the gay ex-pat crowd for their great Sunday Roast Lunches. Our final hot tip is for gay travellers on a tight budget looking for somewhere modern, clean and easy to stay. The B2 Hotels chain meaning Boutique and Budget started in Chiang Mai and has now spread nationwide with room rates as low as 500Bt per night. 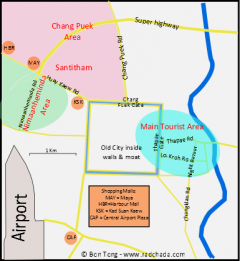 They now have thirteen properties in Chiang Mai including three in Santitham and one in the Nimman Area making them ideal choices if you want to stay cheaply but safely in these areas. 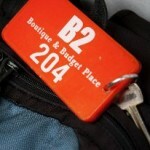 For more information read our article: B2 Hotels – Boutique and Budget – in Chiang Mai. We hope you’ve found the above information useful and hope to see you in Chiang Mai sometime soon.